We have designed Pilot Assist Pro™ to be quick and straightforward to use – but if you have any questions, please feel free to contact us via the contact form below. 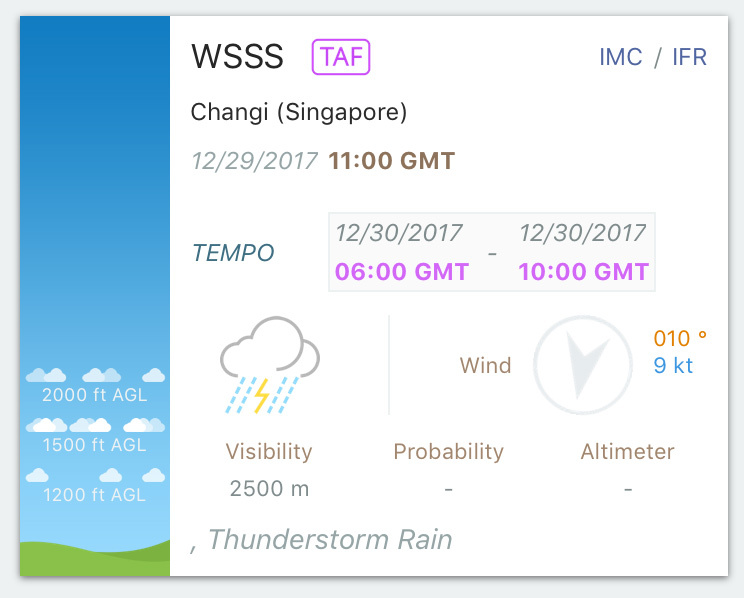 -Weather (METAR/TAF) code updated to match new weather data source provider requirements. -Payment model changed to support subscriptions. -Images can now be added as a background for individual ScratchPad pages. Scribbling on charts is now possible. -Checklist items with pictures attached now show a thumbnail for quick reference. Tap and release to open and close. -The app now remembers your METAR/TAF filter selection. Please contact us via the form and include your credentials. Yes, in the “Edit aircraft” section, select the “Private” option. Then select “Share aircraft”. A private download link will be created which you can share via email with your desired audience. In the create a checklist section, scroll to the very bottom. 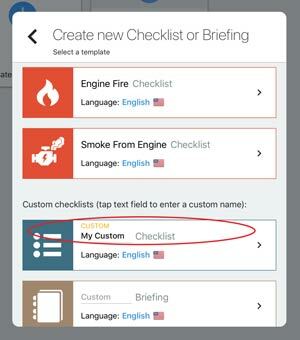 There you will find three fields where you can create custom Checklist, Briefing and Non-Normal names. Pilot Assist Pro™ is available for iOS devices, and can therefore be used on Apple iPhone, iPad and iPod Touch. Pilot Assist Pro™ requires iOS 10 and up, and wifi/3G/4G connectivity to receive the full range of features. Unfortunately, the app is only available for iOS devices at present, and is therefore not available for Android smartphones and tablets. Dropbox is an online file sharing and file storage system.Pilot Assist Pro™ works seamlessly with the Dropbox™ system by creating a special folder within your Dropbox™ account, and then synchronising all of the files within that folder to your Pilot Assist Pro™ app. You can get Dropbox™ for free by going to https://dropbox.com from your desktop, or visit https://itunes.apple.com/us/app/dropbox/id327630330?mt=8 to download the Dropbox™ iOS app. You will only be able to take advantage of all of Pilot Assist Pro™’s features if you connect it with a Dropbox™ account. At present, Pilot Assist Pro™ does not offer file storage via other cloud storage providers. First, make sure that the Dropbox™ app is installed on your device.Pilot Assist Pro™ will automatically initiate the connection to Dropbox™ the first time it needs to use that connection. You will then be asked for your approval to connect Pilot Assist Pro™ to your Dropbox™ account. You will need to enter your Dropbox™ username and password. Alternatively, you can simply click the upload icon from any menu that supports it. When connected, a folder called ‘Pilot Assist Pro’ will be created within the default ‘Apps’ folder on your Dropbox account. All Pilot Assist Pro™ files will be stored within separate directories in this folder. Well, no. We are adding new aircraft to the Online Hangar all the time, but we cannot claim that it contains every single aircraft. Our experienced crew of pilots have created and tested checklists and reference data for a wide variety of popular aircraft.If your particular aircraft does not yet exist within the online hangar, you can quickly and easily create it yourself, saving that aircraft within your personal hangar or even sharing it with other Pilot Assist Pro™ users. If you feel that there is a popular aircraft type that is not included, please contact us and we will do our best to include it at a later stage. The app is designed for real-world aviation, but there is no reason why it can’t be used for all types of flight simulation. In fact, we’ve included a variety of popular commercial jet aircraft within the online hangar for this purpose. Pilot Assist Pro™ allows you to distribute checklists privately. 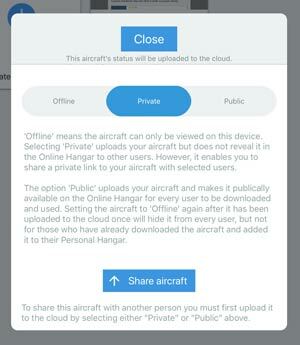 Just select the aircraft status to “Private”, then click “Share Aircraft”. You can then email a private, custom download link to your students or staff. Please note that you need to save the aircraft before you can share it. 2) Change the items within a checklist. 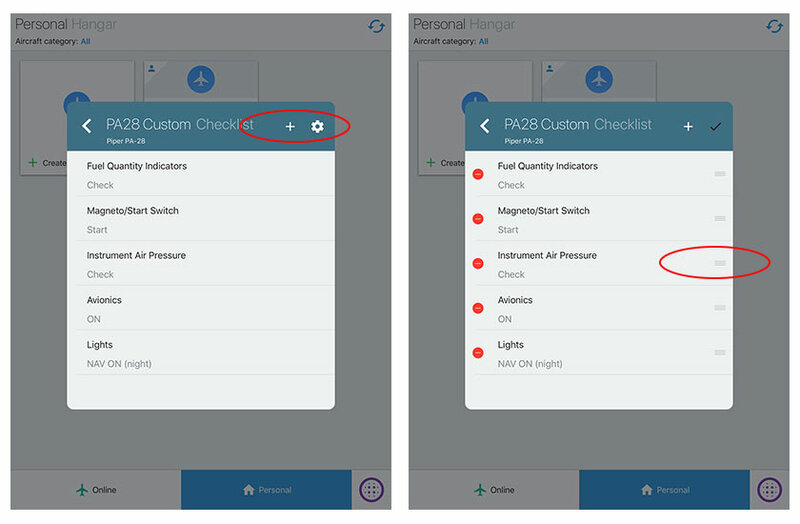 Pilot Assist Pro has a number of available checklist types (such as ‘Pre Start’, ‘After Take Off’ etc), or you can create your own with a custom name. Use this process if you want to change the type of checklist (e.g. change between two templates, or convert from a pre-existing template to a custom checklist with a custom name), or change the language of an existing checklist. First, access that checklist via your Personal Hangar – tap the aircraft you wish to edit, and select ‘Edit Aircraft’. Scroll down to select ‘Checklists & Briefings’. Tap the Settings (gear) icon in the top right corner, and then tap the name of the checklist you wish to edit. You will then be shown the full list of pre-configured Checklist templates as well as Custom checklists. Find the checklist type that you wish to change TO. 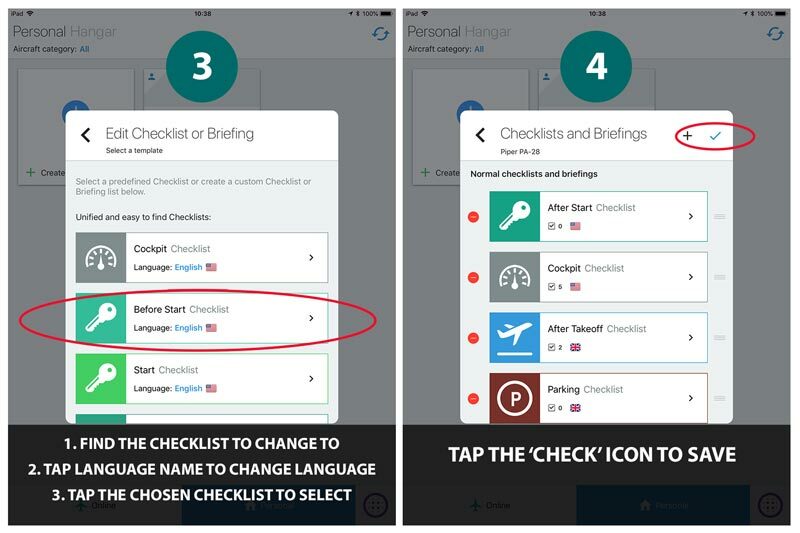 If you wish to change the language used by that checklist, tap the blue language name now, and select your language. Tap your chosen checklist to select it, and then the blue check/tick icon in the top right corner to save. 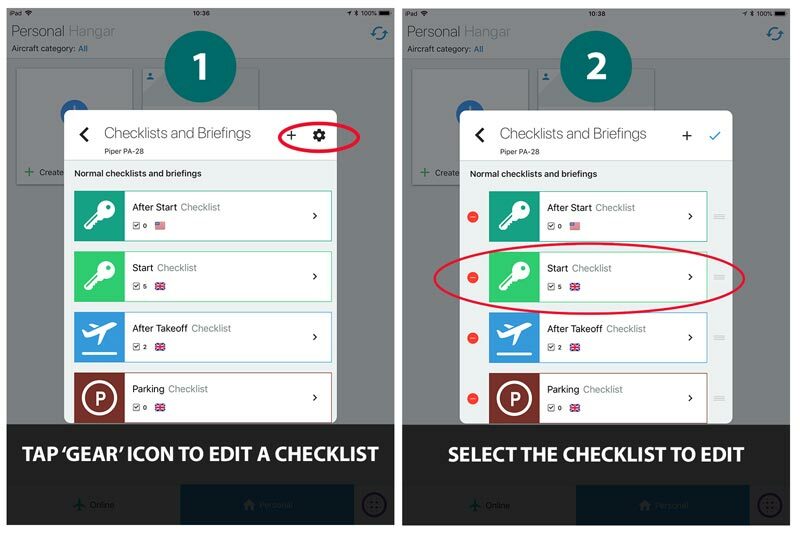 To edit the items within a custom checklist, first access that checklist via your Personal Hangar – tap the aircraft you wish to edit, and select ‘Edit Aircraft’. Scroll down to the ‘Checklists/Briefings’ section, and select the individual checklist you want to edit. New checklist items can be easily added using the ‘+’ button. To delete an item, tap the Settings (gear) icon, and then tap the red ‘-‘ button next to the item you want to delete. To edit an existing item, you should delete that item and create a new one. 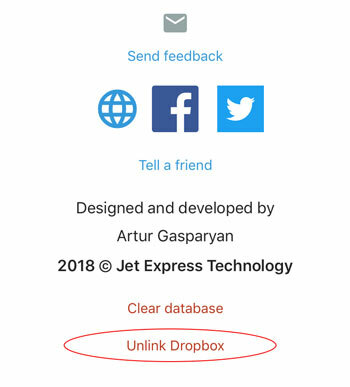 To connect to a different Dropbox™ account, go to the Settings page via the main menu, and tap the ‘Unlink Dropbox’ link at the bottom of the page. You can select and authenticate a different Dropbox™ account next time the app needs to connect. Please allow 24 hours for a response due to time zone differences. If you have not received a response within 24 hours, please check your email’s spam folder or request assistance via our Facebook page.